Absolutely adore this outfit. The shoulders in the top, the full skirt and the feminine colours are so romantic. The shoes are really killing me though! Gorgeous as always Rachel! Loved the sneak peek of this look on Instagram and the full outfit is even better! The loose but tailored fit of that top is perfect! Such a beautiful combination and the floral heels really pull the whole look together!! I love it! Feminine and classy ! This outfit is perfection ! Love this!! Pink & grey is so cute! I’m such a fan of Kate Spade heels! They are always the cutest! Love those shoes! There’s something so classy about a floral heel! Love the pink skirt as well! I absolutely love this skirt! The color is beautiful and delicate. The shoes are perfect too! Those floral printed heels are beautiful. Very pretty and girly outfit! I like your skirt and shoes so much! Love the floral pumps with this skirt! Gorgeous. Loving all the structure in this outfit! I’m new to your blog, but I’m in LOVE with what I see. That office/closet? To die for. I’m new to your blog, but I LOVE what I see. That office/closet space? To die for. In love with the look and color of your skirt! Love this sophisticated look! The soft pink color of that skirt is so cute and perfect for the end of summer. I can see transition this into fall with a leather jacket and some black pumps! Love this look. Ahh I love the combination of pink and grey! All these picks are lovely, especially the sunglasses. This is such a a pretty feminine outfit! I love those shoes! Gosh Rach! Your outfits are just incredible lately! That skirt is stunning. Simply stunning. Those heels are gorgeous. I’ve been so obsessed with those Kate Spade pumps! 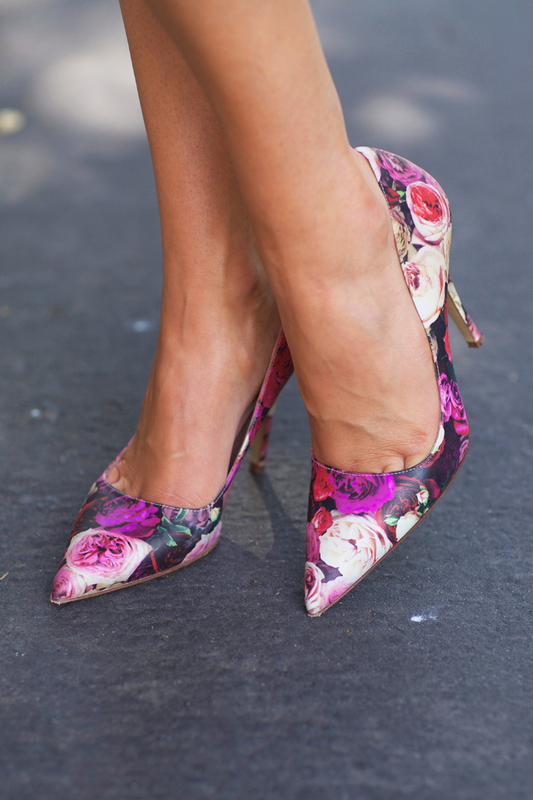 Floral pumps are such add such a feminine touch to any outfit! The Tibi skirt is absolutely stunning! Loving how it pairs with those Kate Spade heels. so beautiful and feminine! love this outfit!!!! Those shoes!! Love love love! This outfit has the perfect amount of girly and edgy. You look beautiful! Good choice on the earrings, it really pops with your outfit! Gorgeous colors of the skirt and heels! Right on the mark again! Obsessed with the soft colors. Such a lovely skirt! That pink is beautiful! And the shape is so fun! You look stunning! I adore the shoes. Super cute shoes, love them. Pink and gray are one of the pretties color combos! Love this look, so chic and elegant! This is such a cute feminine look! Love the the light pink skirt! Love this color combo with your lipstick! That pink skirt is amazing! I love the calf-length skirt look that seems to be coming back. It is so elegant and classic. The flower pattern on the shoes adds a little something! The whole look is perfect. I really love those shoes and so ladylike with that skirt! Those shoes are swoon worthy! What a fabulous outfit! Love this! In love with this look. So feminine and chic! Pairing baby pink with grey – genius. Such a beautiful look. All the details are just perfect and I am in loooove with those heels. love this pretty in pink outfit soo much!!! So cute, the shoes are absolutely gorgeous. Those shoes are amazing and glam the whole look up! Love this feminine outfit and the fact that it’s right balanced -not too casual, not too sweet. Those heels are so lovely! rachel, the skirt and shoes together are fantastic. love this look on you. love those heels! so unique and versatile. Such a gorgeous A-line skirt! & I adore the floral on your shoes. what a gorgeous look! the skirt and shoes are simply amazing!! I’ve never paired pink and grey together, but I’m loving it! Simply timeless Rach! This is beautiful Rachel! Love the simple shapes and the color of that skirt! Perfection! Totes great deal on the fab skirt! Totally in love with this look!! I love this look! The printed pumps perfectly add drama to the outfit! It’s simple, feminine, and classy! Obsessed with this! It’s so sweet and perfect. I especially love the shoes, I think they add so much to the outfit, but remain without your color scheme. Love it! I love how you always look so classy and ladylike. You don’t see many people nowadays with so much sophistication. Love the floral pumps! So chic! I love that skirt so much!! So pretty and fun! Love the basic cool tones with a splash of floral! Pretty in pink! Love your style so so much! I would absolutely love if you did a blog post on your fall/winter must haves! Of course, you look GORGEOUS! Love that pink skirt! Stunning! Wow! Perfect dress for summer wear. I love the pink. Wow ! Perfect Dress For Summer-wear. I love the pink color. Pink and grey is my favorite color combo! Simple yet chic, love it! You look classy. Simple, classic, and elegant! Love! Beautiful skirt and top! Love the gray and powder pink combination. You look so pretty! I love the floral shoes! I adore the colour of your midi skirt, it’s beautiful! This look is so feminine and graceful and those pumps are amazing! I really love the colors in this look. The shoulders are amazing! I love sculpted shirts like these! Loving this look! So chic, while remaining comfy and casual!